So, the new install of Windows went smoother than I could possibly have imagined… Still sitting here over a week later wondering what exactly is going to crash unexpectedly! Since then I’ve been working on both my sites, using WeeMann.co.uk as a testing ground for learning how to code, then putting the best bits onto SiMannDriving.co.uk. As it stands I’ve made SiMannDriving a frames style site, but I don’t like the way it’s working, so that’ll be changed back when I get a mo. On WeeMann I’ve added a couple of pages: Home, Media (sparse at the mo, but who knows?!) and detail pages on vQp and The Hair Bear Bunch who, incidentally, will be playing in Telford in May. So, just a short day today, so I figured I’d get some other constructive stuff done. My PC had other ideas. I started last week when it froze a couple of times then took ages to reboot. Yesterday it took me 4 hours to get it booted (by this time I realised that there may be some kind of problem!). I decided to run a virus check and, lo and behold, there was a virus. “Would you like to delete the infected file?” asks my friend AVG. “Yeah, go on then” I reply. This morning, nothing. Refused to boot at all. After a long day expecting to have to fork out loads of money and still lose all my important files I’ve finally got to the point where I’ve managed to “Repair” Windows. Not sure what that means as it still won’t boot up, but the little blue bits that run across the bottom of the screen are now green, just like when I first bought it, so perhaps it’s cleaner inside. I’ll have another go tomorrow. In better news, I’ve figured out why the Wii didn’t seem to work when connected through the DVD player. One simple setting that I set over Christmas and meant to change back. 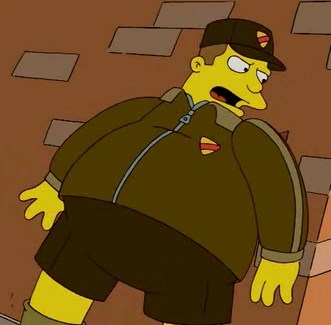 Family Member In The Simpsons? As an update, having watched the new episode, it seems that Comic Book Guy’s new superhero, Everyman, is a distant relative of mine when out of costume – Avery Mann. 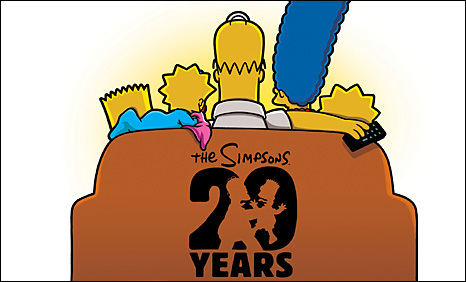 20 years ago today the first episode of The Simpsons aired. Actually, that’s a lie. Originally there were short episodes airing on The Tracey Ullman Show and a few weeks prior to the 14 Jan 1990 episode was the first episode proper – Simpsons Roasting On An Open Fire. But today’s the day they’re treating as the anniversary, so who am I to question?! My favourite epsiode is season 8’s El Viaje Misterioso de Nuestro Jomer where the family go to a chilli cook off and Homer ends up eating an hallucinogenic chilli pepper. Check out Wikipedia at http://tinyurl.com/aq9toq for details. Well of course, everything looks bad if you remember it. Tonight sees a brand new episode with the start of season 21, Homer The Whopper, where Homer becomes a super-hero. Sky 1 at 7:30. One of my oldest, dearest friends has got herself a place in this year’s London Marathon. I’ve known Jenny and her husband, Gareth, since I was about 16 and my wife and I are Godparents to their younger daughter, Lucy. Last September (long enough ago that April seemed like a distant prospect) I signed myself up to run the London Marathon for HemiHelp. Now with just over 3 months to go, I am starting to realise exactly what I have volunteered for! The 26.2 miles from Greenwich to St James Park is not going to be easy but giving up is not an option as I have pledged to raise at least £1500 in sponsorship! HemiHelp works with children and young people with hemiplegia, their families and carers. Childhood hemiplegia is caused by damage to the brain which occurs before, during or soon after birth and the effects are similar to that of a stroke. Hemiplegia affects approximately 1 child in every 1000 with some children having associated conditions such as epilepsy, emotional and learning difficulties. As many of you know Lucy our 5 year old daughter has a mild right hemiplegia and HemiHelp have provided invaluable information and support to us. While I realise soon after Christmas is not the ideal time to send out requests for sponsorship, I need to get started towards my fundraising target. No amount is too small (or too large!!!). Your money will go direct to HemiHelp and will make a real impact on the lives of thousands of children in the UK who are affected by hemiplegia. If you wish to make a donation the easiest way is via my online fundraising page www.virginmoneygiving.com/JennyBlower . All donations are secure and go straight to the charity and virginmoneygiving will reclaim 28% gift aid allowance from the taxman on all eligible donations. Alternatively if you prefer please send me a cheque made payable to HemiHelp. If you would like to send a cheque it would also be great if you could complete a Gift Aid declaration which I can forward onto you. Thank you for your support of me, Lucy and HemiHelp – I will of course keep you posted as to how I get on! We’re hoping to get down to support Jenny on the day. Interestingly, within a few hundred yards of the start, she’ll run past either their old flat or the one, just round the corner, that my wife and I shared when we were first married. I’d struggle to run that far, but at that point she’ll still have about 26 miles to run. Think I’ll get the Tube if we decide to see her across the line. I know we’ll speak before then, but good luck Jen. I’ve been fairly lucky with the weather so far, the snow hasn’t been bad enough to cancel any lessons (apart from the one student who got snowed in). That’s changed today as it’s not stopped snowing all day and I had to cancel my first lesson on weather grounds. Actually, that’s not strictly true as I’ve got a student who has a test booked for tomorrow and there’s no way that’s going ahead, so we cancelled a lesson we had booked for this morning. What a start to a new year and only my second month as an independent Driving Instructor. Still, managed to get loads of work done on my websites (blogs now set up on both), so the time wasn’t wasted. Just a shame I’m not getting paid for my time!